A relatively quiet stretch for the sun in recent years does not necessarily herald an impending solar activity low of historic proportions, a new study reports. The sun was quiescent from 2005 to 2010, spouting off relatively few flares and eruptions of solar plasma known as coronal mass ejections (CMEs). That dry spell lasted about twice as long as usual, prompting some scientists to predict that a "grand minimum" of solar activity — the likes of which hasn't been seen in 300 years — could be on the way. But the opposite could just as easily be true, the study suggests. 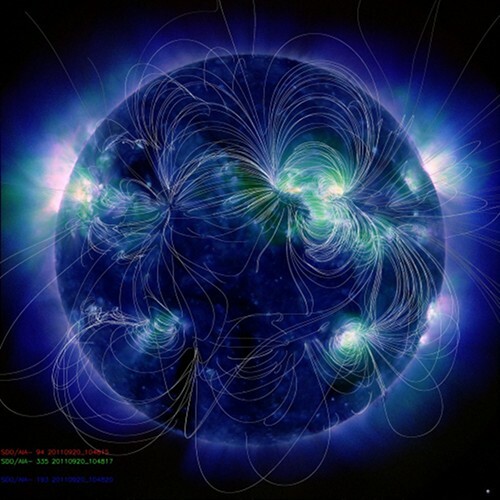 "[A]fter looking at data of past solar activity, we have pointed out that it is just as likely that the sun will go into a grand maximum again (it just came out of one) than into a grand minimum," said study lead author Sami Solanki, of the Max Planck Institute for Solar System Research (MPISSR) in Katlenburg-Lindau, Germany. Another sunspot number record for Solar Cycle 24 has been shattered: On Wednesday, November 9, the daily sunspot number reached 220, the highest it has been in more than eight years. The last time the sunspot number was higher than 220 was November 1, 2003 when the number was 277. The next day -- November 10 -- the daily sunspot number dropped back to 164. Two days before it reached 277 in 2003, the sunspot number was 330, a harder record to beat. 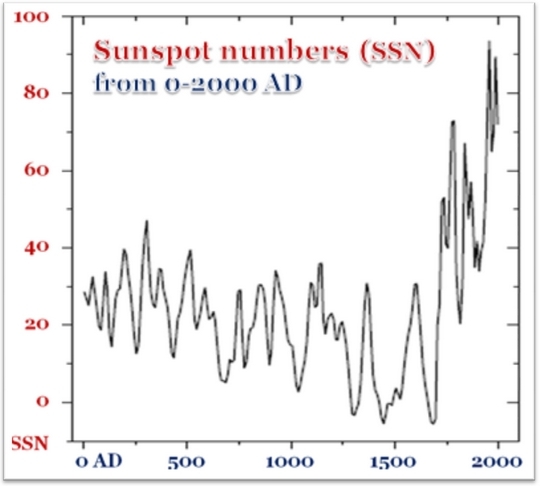 If you think Solar Cycle 24 is weaker and still progressing slower than previous solar cycles? You are correct. 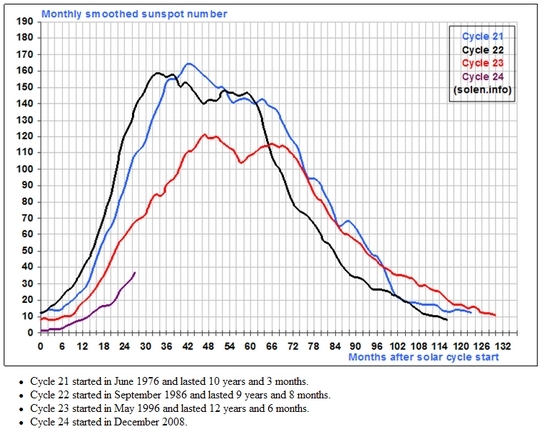 For a comparison of Solar Cycles 21, 22, 23 and 24, click here for more. Our Sun continues to be very active, with most days revealing more sunspots. We saw one new sunspot group on October 9, another on October 10, two more on October 11 and two more on October 12. But that’s not all: There was another on October 13, two more on October 15, two more on October 17, one more on October 19 and three more on October 20. There have been 28 new sunspot groups making an appearance in the last 30 days. But the biggest news is the sunspot number yesterday, Thursday, October 20. The daily sunspot number was 195, a level not equaled or bettered since nearly eight years ago, on November 26, 2003, when it was 209. The closest the daily sunspot number came to equaling Thursday’s value was on July 4, 2005 when it was 192. It's been a lovely Indian summer - but it could come back to bite us. That's what scientists predict after working out the first ever pattern of activity for the sun. According to research, the sun runs on an 11-year cycle - and this affects winter weather over the northern hemisphere. No phenomenon in astronomy has been studied more closely than solar flares, gigantic eruptions on the Sun that can affect Earth's climate and even disrupt power grids. Scientists have been watching the Sun with ground based instruments and orbiting satellites for years, so it might be thought that we know a lot about such eruptions. Well think again. A new report from NASA has revealed that, like earthquakes, solar flares often have aftershocks. Moreover, the aftershocks can emit bursts of ultraviolet (UV) radiation more powerful than the original eruption. Combine this new finding with the recently uncovered linkage between fluctuating UV levels and El Niño, and the Sun-Climate connection looks stronger than ever. Sept. 19, 2011: One hundred and fifty two years ago, a man in England named Richard Carrington discovered solar flares. It happened at 11:18 AM on the cloudless morning of Thursday, September 1st, 1859. Just as usual on every sunny day, the 33-year-old solar astronomer was busy in his private observatory, projecting an image of the sun onto a screen and sketching what he saw. On that particular morning, he traced the outlines of an enormous group of sunspots. Suddenly, before his eyes, two brilliant beads of white light appeared over the sunspots; they were so bright he could barely stand to look at the screen.